CoffeeBreak is a newsletter distributed to Averett faculty and staff to keep them up to date on campus activities and information. Please send information you would like included in CoffeeBreak via this form by 4:30 p.m. March 13 for a March 18 publication. Trish Coleman, Assistant to the Chief Financial Officer, is leaving Averett University to go back into government contract work. Please come by Main 131 on Friday, March 13, between 3 and 4 p.m. to wish Trish good luck on her new job! Faculty, staff and students are invited to attend the Grand Opening celebration for the Academic Commons at Blount Library on Thursday, March 19 from 4 to 7 p.m. Light appetizers and drinks will be served and there will be live entertainment. Drop in and see the newly redesigned spaces and learn how the Academic Commons can benefit you! A roundtable discussion and presentations by our students who have recently studied abroad has been rescheduled for Tuesday, March 17 from 11:30 a.m.-1 p.m. in the multipurpose room of the Student Center. Come hear about the experiences of Angelica Orlikowski (Business in Ireland), Allyson Payne (Biology in Ireland) and Victoria Rackliff (Journalism in France). The event is open to faculty, staff and students and lunch will be served. The New Website: Are We Missing Something? 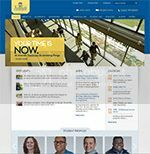 The feedback about Averett’s new website has been mostly positive. (Many thanks for the kind words!) However, some content appears to have been inadvertently dropped in the switchover from the old website to the new one. First, please know that this was accidental, not something that was done on purpose – nor with any kind of hidden motives! Second, we sincerely apologize to anyone who may have been adversely affected by these oversights. Third, if you see any important content that is missing in your area of the website, please don’t hesitate to send corrected copy to Ed Jones at ejones@averett.edu. Thanks, and again, our heartfelt apologies! The Schoolfield House Booksellers at Averett University will operate from 9 a.m.-4 p.m. during the week of Spring Break (Monday, March 9-Friday, March 13). The Bookstore will be closed Saturday, March 14 and Sunday, March 15. Take an extra 30 percent off already reduced items in the clearance section at the Schoolfield House Booksellers. In-store only now through Sunday, March 22. Don’t miss out on the great bargains! On World Poetry Day (Saturday, March 21) Josephus Thompson and The Poetry Project will be coming to Danville to host a Spoken Word Poetry Cafe. This event will be a kick-off for a regional Spoken Word Program that will be available to Averett students. Come down to The Venue (318 Main St.) from 5-6:30 p.m. to join us for a great performance and to get a sneak peek of what’s to come! For more information about our performers, visit http://thepoetryproject.com. Week to Engage will be held April 13-17 during National Volunteer Week. As soon as students return from spring break, we will have the list of projects ready for everyone to start signing up! We are encouraging more faculty and staff participation, so please be on the lookout for ways you can sign up for a project, too! There will even be opportunities for entire classes to engage in service. If you would like to sign your class up for a project, or if you have a project that you would like to do that isn’t on the list, please contact Rachel Covington at rcovington@averett.edu. Please encourage your students and colleagues to participate! It’s time to nominate your peers for the annual Faculty and Staff of the Year Awards. Nominations are due by 4:30 p.m. Tuesday, March 31 and may be emailed to awards@averett.edu. In your nomination, you must include why you are nominating the faculty or staff member. For more information about the awards, please click here: 2015-outstanding-awards. Don’t forget that the Wednesday Club will be hosting Dr. Diane Burke today (March 11) at 3:45 p.m. at 1002 Main Street here in Danville. This event is open to the public and Averett faculty, staff and students are encouraged to attend.